AUTOCHECK CERTIFIED, 1-OWNER, SOUTHERN, RUST-FREE TRADE-IN. TOP OF THE LINE CHEROKEE LATITUDE 4X4 LOADED WITH ALL OF THE POWER OPTIONS, CHROME WHEELS, KEYLESS ENTRY, AND LOTS LOTS MORE. INCLUDED ARE ALL OF THE ORIGINAL BOOKS AND MANUALS! WHY BUY NEW? 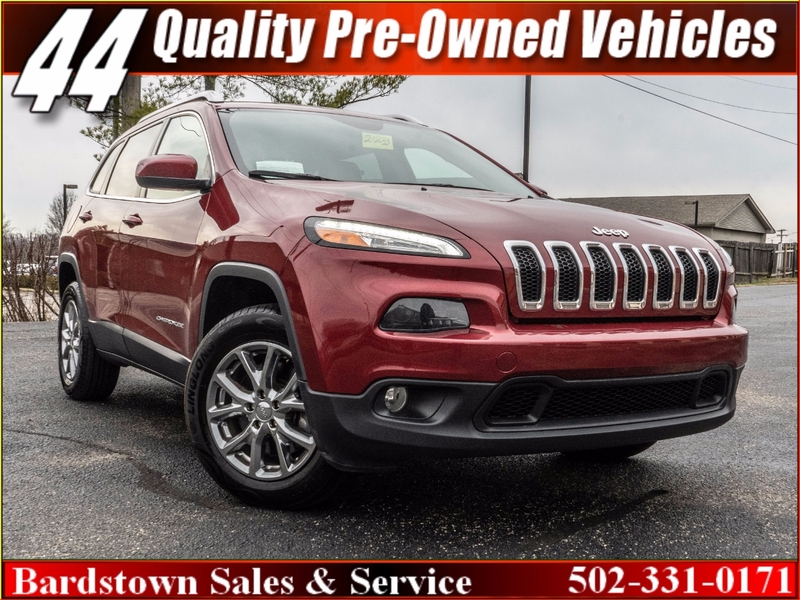 THIS 1-OWNER, LIKE NEW CHEROKEE IS OVER $10,000 LESS THAN THE COST OF A NEW ONE. We are a family owned and operated dealership who has been in business since 1988. We currently have over 400 quality pre-owned vehicles in stock. If we don't have it, we will locate it for you. See our inventory disclaimer at 44automart.com. for more details. 44 Auto Mart is currently serving ELIZABETHTOWN, LEITCHFIELD, HARDINSBURG, BROWNSVILLE, MUNFORDVILLE, HODGENVILLE, CAMPBELLSVILLE, LOUISVILLE, CLARKSVILLE, JEFFERSONVILLE, NEW ALBANY, BARDSTOWN, SPRINGFIELD, LEXINGTON, PADUCAH, BOWLING GREEN, FRANKFURT, ASHLAND, WINCHESTER, VERSAILLES, TAYLORSVILLE, SHELBYVILLE, FORT KNOX, LAGRANGE, RADCLIFF, BULLITT COUNTY, JEFFERSON COUNTY. HARDIN COUNTY, NELSON COUNTY, LARUE COUNTY, GRAYSON COUNTY, MEADE COUNTY, WASHINGTON COUNTY, MARION COUNTY, OLDHAM COUNTY, FAYETTE COUNTY, ADAIR COUNTY, BOYD COUNTY, GREEN COUNTY, AND MORE! WE CAN FIND FORD, LINCOLN, CHEVROLET, CORVETTE, GMC, CADILLAC, BUICK, DODGE, RAM, CHRYSLER, JEEP, CUMMINS, DURAMAX, POWERSTROKE, TOYOTA, SCION, SMARTCAR, LEXUS, NISSAN, INFINITI, MAZDA, SUBARU, HONDA, ACURA, KIA, HYUNDAI, GENESIS, MERCEDES, BMW, VOLKSWAGEN, AUDI, JAGUAR, RANGE ROVER, TESLA, MASERATI, and more! WE SPECIALIZE IN TRUCKS, DIESELS, SPORTS CARS, SUVS, SEDANS, HATCHBACKS, HOT HATCHES, AMERICAN MUSCLE CARS, RVS, TRAVEL TRAILERS, MOTORHOMES, COUPES, CONVERTIBLES, OFF ROAD VEHICLES, MOTORCYCLES, ATVS, BOATS.